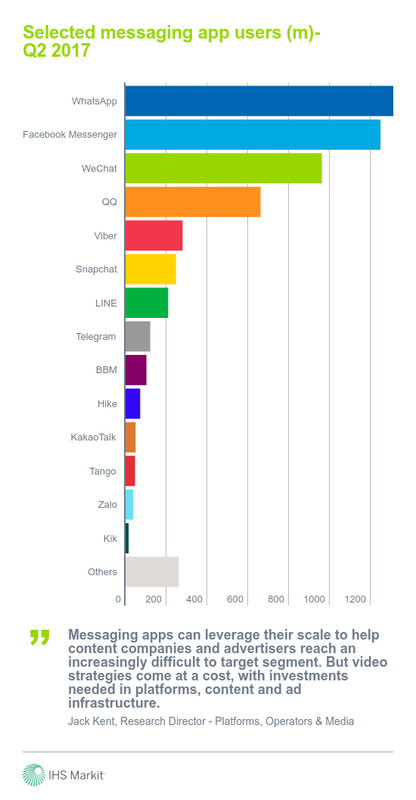 Mobile Messaging apps claimed an aggregate audience of more than 5.6 billion users at the end of Q2 2017. Having a strong video proposition is vital for almost all messaging and social apps – this includes video calling, advertising, messaging, live broadcast and professional content. Media and content companies can face competition from new distribution channels. However, there is also an opportunity to provide content for new platforms to reach a youth audience which is increasingly difficult to target through traditional channels. Video calling is now commonplace for most messaging apps – the new focus is on live broadcasts and group video chat. Asian apps including Line, Kakao and WeChat have some of the most advanced messaging app video platforms and business models. As with other messaging app services, Western companies are often followers, not leaders. Japan-based app Line made video one of its three strategic priorities along with AI and connectivity in 2017. The increasing diversity of video products and services provided by messaging apps means monetisation strategies must also adapt to different video formats. Facebook’s new ‘Watch’ feature underscores the importance of video to drive both engagement and revenues. It is different for WhatsApp, which will instead continue to focus on communications with monetisation coming through enterprise services for businesses to connect with users rather than traditional advertising or video content. Social and messaging apps are investing in original mobile video content. Snap signed deals with US studios to produce original short form content. In Thailand, Line is involved in the production for over 70% of its content on Line TV.